In my last post I promised a separate post on the Pallava & Pandya Caves in Trichy. So, here it comes. Well, there are 2 caves that were built by Pallavas & Pandyas here in Trichy. Both are protected by the Archeological Survey of India (ASI). One is enroute to the Uchi Pillayar Temple. The other one is at the basement of the hillock. Yeah, I missed this one at the basement first and proceeded to the Uchi Pillayar. Enroute, at the Thayumanavar Temple I enquired about the Pallava caves. Only at this point I realized I missed one at the basement. The other one was right here, well, almost here. From the Thayumanavar Temple, just after some 10 steps enroute to the Uchi Pillayar Temple, the Lalithankurar Cave is located to the left. Could be easily missed, if not carefully looked for. That is its benefit also, it is not populated and the visitors of the Uchi Pillayar miss this usually!!! This was built by Mahendra Varma Pallava. He originally called it ‘Lalithankura Pallaveshwara Griham’. Lalithankura means ‘Charming Off-Spring’, which is one of the titles of Mahendra Varman. This name is inscribed here. As you enter the cave to the left is the famous Gangadhara Panel and to the right is the Garbha Griham (Sanctum Sanctorum). The Gangadhara Panel is celebrated by all art historians. It’s such a masterpiece. It’s a high relief panel. Centrally placed is Lord Shiva as Gangadhara. Gangadhara is the Lord Shiva who holds River Ganges when she comes to the Earth from Heaven with great force, after Bhagiratha’s penance (Remember the Great Penance Panel from Mahabalipuram?). The Earth would not take this force. So Lord Shiva accepted to hold her in his matted locks, so the speed is controlled. Here in this panel, he is ready to take her in a single strand of his hair. His left leg is on ground and his right leg is on a Bhootha Gana. There is a dog atop and I have no idea of its specifics. There are 4 attendants in the scene on either sides at the top and bottom. In the bg are 2 Rishis (Saints). The incredibility of the Mahabs Great Panel is understandable – Narasimha Varman was Mahendra Varman’s son!!! Gangadhara has 4 arms and is adorned with amazing intricate jewels. His sacred thread across his torso is vastra-yagnyopavitha which means sacred thread as a fabric. He has a elaborate tall head gear which somehow reminds me of the headgear of Bodhisattva Padmapani painted in Ajanta. He wears a dhoti like lower garment in a soft delicate fabric. The lower panel of the panel has a design similar to the Sanchi Stupa. May be Mahendra Varman went there for a visit!!! Or maybe he hired a designer from Sanchi!!! I dunno!!!!! Opp. to this panel is the Sanctum Sanctorum. This must have been for Lord Shiva in the form of Shiva, though there is nothing inside now. On either sides are the Dwara Balakas. The whole structure has 4 pillars in the front and 4 pillars in the interior and 2 more pillars near the panel. There are 2 types of scripts inscribed here. One is the Pallava Grantham and the other is Old Tamizh (Tamil). Pallava Grantham is inscribed in all of the pillars. What is this Pallava Grantham? That was the script that was developed during the 7thC AD during the Pallava Reign. It is a derivative of Brahmi (Remember the Tamil Brahmi in Arnattan Malai?). Grantham was the script with which several languages of the South Asia including the languages of Java, Sumatra, Khmer, Borneo, Thai, Laos, Combodia, Vietnam etc. Amazing isn’t it? I was overwhelmed standing there in that place. I was witnessing the history in front of my eyes. The most ancient form of my language!!! The wall was completely inscribed with Old Tamil of the 16th & 17th C AD by Chirappalli Kings. As I say always, I again say, as far as Indian history is concerned, I would just not consider 16th C stuff as history also!!! The wall was inscribed with Sathagam (100 songs). Somehow for me it looked like a diary. The whole wall with several, several words all over. From there I proceeded to the second cave. I enquired all along. So where did I miss it? Just after the office of the temple and just before the actual entrance of the steps that lead to the Uchi Pillayar is a road. I returned all the way and at the road I had to take a right. And after some 4 to 5 homes, a tiny lane that almost looks like a private road had to be taken to the right (This is the second last right and has a water-pump at the turn). At the end of this tiny lane is the entrance to the fantastic structure of the 2nd cave. A huge ground and the majestic cave with kids playing in the ground – it was a relaxing visual treat. This cave has 4 pillars in the front and 4 in the interiors in front of the 2 sanctum sanctorum. In the inner wall are 5 panels. This seems more incomplete when compared to the Lalithankura Cave. This was excavated by the Pandyas in 8th C AD. The 2 sanctum sanctorum are of Lord Shiva and Lord Vishnu. Both have Dwara Balakas at the entrance. 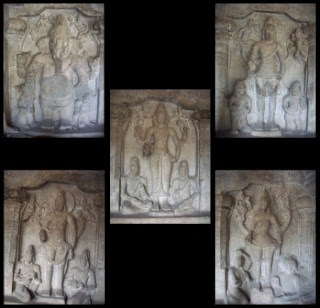 The 5 panels are of Lord Ganesha, Lord Subramanya/Karthikeya/Muruga, Lord Brahma, Lord Surya and Goddess Durga/Kotravai. All are high reliefs and are standing figures. Somehow, the structure of Lord Ganesha appeared a bit funny for me, thanks to the short stout legs. His torso is normal but from waist below its short. I haven’t seen such a styling so far. At the entrance is a top panel which has a line of Yaalis which has some elephants and monkeys in the midst. I had seen a horizontal frieze similar to this at Kalyana Venkatramanar Temple in Thanthondrimalai. After spending some time there, I contemplated visiting another temple in Trichy. This is the biggest disadvantage of temple tour – the timings. It has to start real early and finish off by 12 noon or max by 1 pm, coz all the temples close in the noon for Nadai Moodudhal. It re-opens at 4 pm. It was 12 pm at this point and I wondered if I should take a chance. I did and got to visit another temple as well. Coming back soon about it!!! Click here for the presentation by Prof.Swaminathan about these caves. hey busha...nice pics and well written.. The entrance to the second cave looks fantastic! Dear Busha, (I hope it is okay to call you so). This is Ocean Girl, formerly of Live High. I apologise for not visiting you in a while. I see that your travel has taken you to amazing places. And the caves were amazing. India is one of the roots of civilisation. Thank you for sharing and I promise I will try my best (I know I use political words) to visit you more often. I do not blog much but I still do have the need to blog. And I so do miss my blog friends. This is the real stuff I was looking for. Its not that others have not written about these caves, but many of them tend to be too academic. Thanks for the nice info. Very informative post with lovely pictures.Tamil is acknowledged as one of the ancient languages in the world. You post provides so much information about history,architecture etc.which is of inestimable value from the point of knowledge. I have learned so much from your posts. There is an award for you in my blog.Please pick it up,post it in your blog and pass it on to your friends. Well written, well photographed and well presented. Congrats!! Thank you so much. This is my 10th award and so its so special to me!!! THANK YOU SO MUCH DEAR!!!!! Sounds like a very interesting place and lovely pictures. Sorry to start on critical note, there are few modifications you may do in this post. 1. Both the cave temples are of the Pallavas, Pandyas were not having this part of country. The lower cave does not have foundation inscription however on architectural counts this lower cave can be associated to Narasimhavarman, successor of Mahendravarman. 2. The rail below the Gangadhara panel looks like the rails for Buddhist stupas. You are very correct in your statement, however Mahendra needs not go to Sanchi for this as Amaravati had a marvelous white marble stupa, which has not survived though. Artists from Amaravati might have been employed by the Pallavas. Great to see ur blog. And i liked it very much. Thank you so much for visiting my blog and commenting.